Coventry City will hail the start of a new era when they end their 106-year stay at Highfield Road on Saturday. The Sky Blues' game against Derby will be their last before they move to a new £113m 32,500-capacity stadium on the edge of the city. Their new home is at what was once the Foleshill Gasworks - but, thanks to a £10m sponsorship deal, will be known as the Ricoh Arena. The Japanese IT giant will be the main sponsor of the stadium, which will double up as a concert venue and will also house a casino, hotel and exhibition hall. Yet this impressive venue is a scaled down version of the grand plan that former chairman Bryan Richardson unveiled in 1997. Back then a sliding roof and moveable pitch were the order of the day in an ambitious scheme that quickly hit the rocks. It was revealed the club had not yet bought the site but had already sold Highfield Road to a housing developer - leaving City potentially homeless. Only when Richardson left in 2002 did the move start to look possible again, and although their new ground will be rented off the council, City fans can look ahead with optimism. However, they will also retain fond memories of their old home. Some supporters will remember the still-record 51,455 crowd that cheered City to a 3-1 win over Wolves that clinched the old Second Division title and promotion to the top flight in 1967. Those of a younger generation will remember the dramatic survival battles that characterised City's subsequent 34-year stint in the sun until their relegation in 2001. In truth there have not been many trophies paraded around Highfield Road down the years. 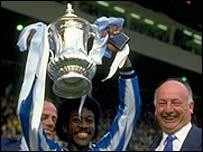 In over a century the only major prize to arrive there was the FA Cup won in thrilling style in 1987. But despite the team's lack of honours, the ground itself has made a lasting impression on English football. Much of this was thanks to the forward-thinking of Jimmy Hill on his arrival as manager in 1961. Hill's innovation and invention during an on-off 14-year spell in various roles at the club saw him make sweeping changes off the pitch. 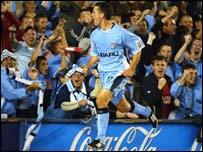 Many of his ideas which were first seen at Highfield Road are now commonplace throughout the game. A revolutionary new pre-fab stand that was designed to adapt to any stadium was built in 1964, followed by the League's first electronic scoreboard later that year and the introduction of pre-match entertainment. Hill was also behind English football's first ever beamback when City's game at Cardiff was watched by 10,000 fans at their own ground. He resigned as manager in 1967 to pursue his career in TV but he was back as managing director in 1975 and later became chairman. It was on his return that he was to make the most telling transformation to the ground, making it England's first all-seater stadium in 1981. This was eight years before the post-Hillsborough Taylor report saw the enforced phasing out of terracing at all top-division clubs. Although City's experiment essentially failed - a fall in attendances meant some standing areas returned two years later - Highfield Road was again ahead of its time. Sadly that is no longer the case. More ground improvements were made between 1993 and 2001 but they could not disguise the fact the club needed a new home. Within months there will be nothing left at the present site to show for over a century of footballing history, and a housing estate will soon spring up in its place. It is a sad end for what was an inspirational setting - but the Sky Blues have a bright future.